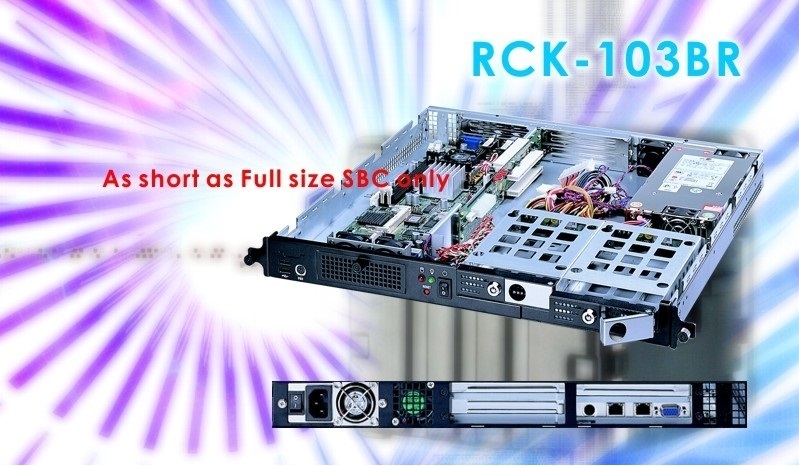 AICSYS, Inc. releases the best most dependable 1U rackmount chassis: RCK-103BR. For today’s IPC rackmount applications, where space is very expensive, you need a very compact chassis yet reliable for your networking server with a capability for hot swapping the drives without interrupting the systems. AICSYS Inc. 1U 19" RCK-103BR is a heavy duty steel constructed rackmount chassis with only 422 mm (16.6") depth, but it is able to support a full size SBC through a PICMG 1.0 with 3 PCI slots or a PICMG 1.3 butterfly backplane with 1 PCIe x 16 slot. It is equipped with one (1) slim ODD, two (2) 3.5" SATA HDD mobile racks, and one (1) internal space for 2.5” SSD or HDD. A set of two lockable Drives for secure and easy hot swapping with USB and PS/2 ports is placed at the front panel and a RS-232 at the rear panel. Two 4cm ball-bearing fans with replaceable air filters at the front and one at the rear ensure a perfect cooling system for the unit. In addition to the Power On/Off and HDD activity LEDs, On/Off and Reset switches at the front, this product is also supported by ATX power supply up to 460W. RCK-103BR supports PICMG 1.0/1.3 single board computer, features high bandwidth network ports to meet the more and more demanding variety of application requirements. Contact us today to see what a difference AICSYS product could make for your next project.